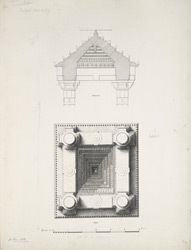 The pulpit canopy of Bibi Achut Kuki's Mosque at Ahmadabad in Gujarat from James Burgess' 'Original Drawings [of] Muhammadan Architecture of Ahmadabad.' The Bibi Achut Kuki mosque and tomb complex was built in 1469 for the wife of Imad al Mulk, a minister of Sultan Mahmud Begada (r.1459-1511). Located north of the city along the Sabarmati river in Hajipur, the Bibi Achut Kuki mosque and tomb are enclosed with a rough stone wall. There were originally seven minarets, three on the outer entrance and two on the facade of the mosque, most were ruined in the earthquake in 1819. "The minbar or pulpit is raised in the style of most of those erected in Gajarat in the fifteenth century, with a passage under it, and having the upper platform covered by a small square canopy supported by four pillars--the whole being richly carved. The canopy is one of the finest preserved at Ahmadabad...[this illustration] gives an idea of its form and elaboration that render detailed description unneccesary."